Blistering Barnacles, Is It Really Them? The choice of a Halloween costume this year wasn’t even a choice. 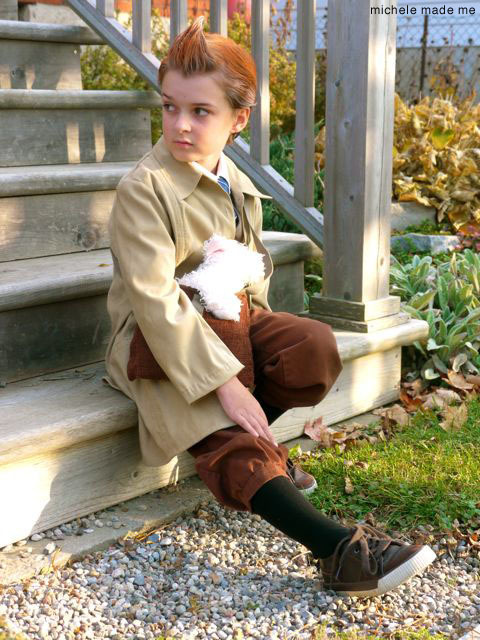 “I’m going to be Tintin,” The Boy pronounced. The fact that he’s been reading The Adventures of Tintin exclusively for the last 10 months should have been my first clue. Still, I respect a man who knows his own mind. Unlike many other fictional heroes, Tintin has a full wardrobe. So we had to decide which version of the intrepid young reporter we wished to bring to life. We decided on this one. Pulling the costume together was pure fun. There were only a few things to do. I shortened and dyed a pair of pants for the trousers. I deconstructed an old purse of mine and converted its component parts into a small and simple carrying case for Snowy of course. 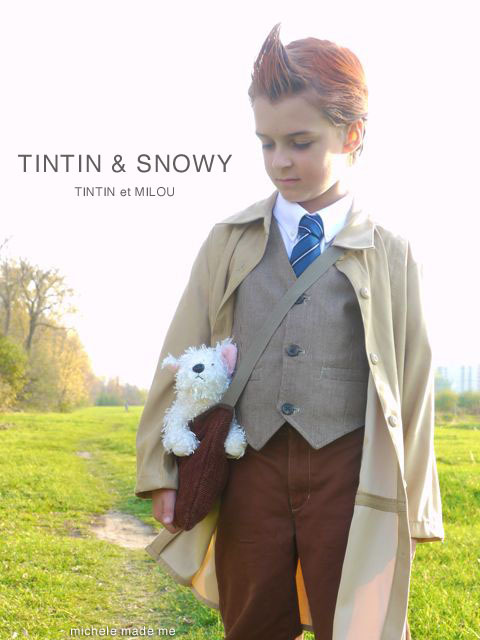 Because Tintin without Snowy is just plain wrong. As luck would have it, I found Snowy himself in the large and lonely pile of plush toys at the thrift store. I adopted him at once. But the biggest challenge was the trench coat. For that, I took a women’s beige blouse and altered it to fit The Boy. I am SO pleased with how well that worked, and a little surprised too actually… The rest of the costume (tie, vest… etc) we had at home. For Tintin’s trademark quiff, I used some magical stuff: got2b spiking glue. It worked like a charm! I’m thinking of trying it myself one day. Wouldn’t that be a hoot?… And finally, I finished off The Boy’s strawberry blond look with a little coloured hairspray. When it came time for the photo shoot, The Boy decided he would portray his hero as the strong, silent and serious type. He never once broke character. I can say this for The Boy. 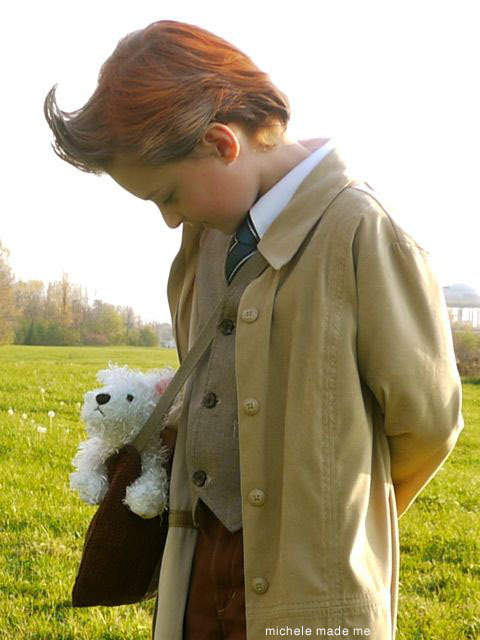 He makes a sweet little Tintin. And his level of commitment is truly admirable. « Yes. Sometimes I share pictures of dirt. Oh my Gosh! It is amazing – I love everything you did for the costume!! "And his level of commitment is truly admirable." Like his mother, huh!? What a fantastic costume! And most excellent photo model Well done both of you! So many great poses and background settings. Precious memories for you both as the years go by. One of these definitely belongs on a poster – or at the very least a nice size wall print. You did a fabulous job and The Boy is a wonderfujl photo model!! I am seriously, seriously impressed. He certainly looks the part! Well done, both of you!! Oh, he looks simply adorable!! Great job–and the pictures are beautiful too. This is such an amazing costume!! He looks perfectly in character. Love it!! That is gorgeous and wonderful, Michele! Lucky boy to have a mama who can bring his vision to life! Cheers to you both! LOL Brilliant result and a priceless choice on his part! Hes a natural model too!! Oh me, oh my! What a wonderful costume. I'm so impressed with how you made the trench coat. The costume came together so perfectly. 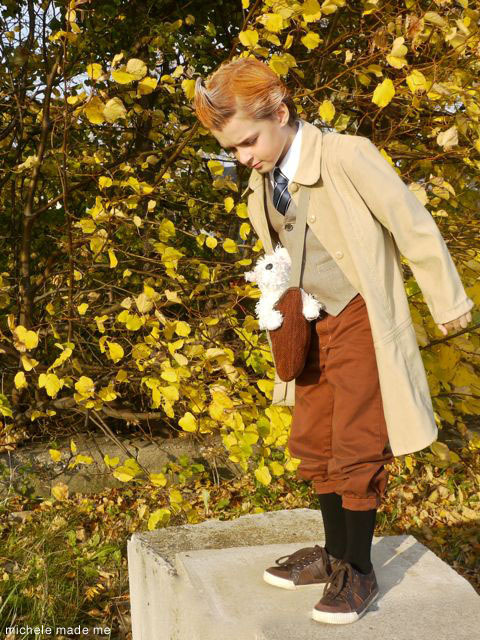 And the boy makes a great Tintin! Very convincing and I love the poses. I thought I was looking at Tintin come to life. What a beautiful job! At first I wasn't sure if these pictures were from a movie or yours! Such a great model! Well done! That is a fantastic holloween costume! Have fun trick or treating. Wonderful pictures! Great costume and an original idea! I think you're very clever/crafty to have recreated the character and details as inexpensively as possible with stellar results. The love you put into it/everything shows. Oh my goodness!! He is absolutely, completely, beyond adorable. I just love the whole thing – his demeanor is dead on!! 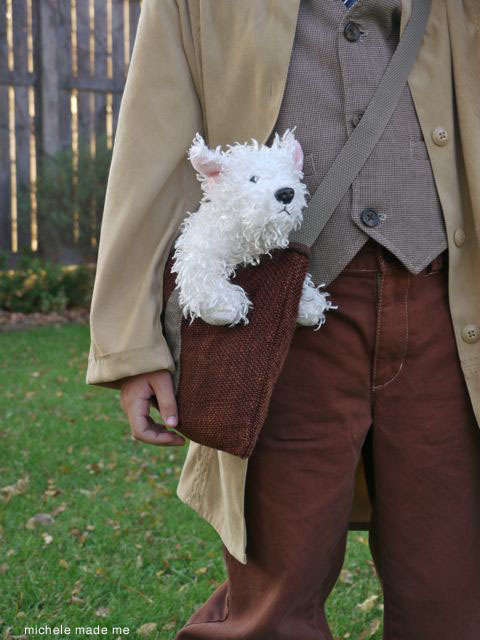 Do you allow me to show one Foto of "Tintin" on my blog tomorrow? I want to post "Karneval" costumes fpr children. Yours is such a great costume. I prefer to keep the photos of my child on this blog if you don't mind. Thanks for understanding.